The U.S. Geological Survey (USGS) Multi-Hazards Demonstration Project in Southern California (Jones and others, 2007) is a five-year project (FY2007-FY2011) integrating multiple USGS research activities with the needs of external partners, such as emergency managers and land-use planners, to produce products and information that can be used to create more disaster-resilient communities. The hazards being evaluated include earthquakes, landslides, floods, tsunamis, wildfires, and coastal hazards. 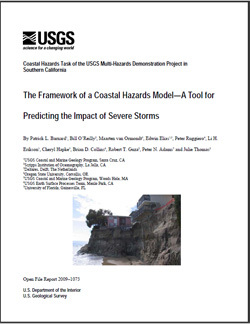 For the Coastal Hazards Task of the Multi-Hazards Demonstration Project in Southern California, the USGS is leading the development of a modeling system for forecasting the impact of winter storms threatening the entire Southern California shoreline from Pt. Conception to the Mexican border. The modeling system, run in real-time or with prescribed scenarios, will incorporate atmospheric information (that is, wind and pressure fields) with a suite of state-of-the-art physical process models (that is, tide, surge, and wave) to enable detailed prediction of currents, wave height, wave runup, and total water levels. Additional research-grade predictions of coastal flooding, inundation, erosion, and cliff failure will also be performed. Initial model testing, performance evaluation, and product development will be focused on a severe winter-storm scenario developed in collaboration with the Winter Storm Working Group of the USGS Multi-Hazards Demonstration Project in Southern California. Additional offline model runs and products will include coastal-hazard hindcasts of selected historical winter storms, as well as additional severe winter-storm simulations based on statistical analyses of historical wave and water-level data. The coastal-hazards model design will also be appropriate for simulating the impact of storms under various sea level rise and climate-change scenarios. The operational capabilities of this modeling system are designed to provide emergency planners with the critical information they need to respond quickly and efficiently and to increase public safety and mitigate damage associated with powerful coastal storms. For instance, high resolution local models will predict detailed wave heights, breaking patterns, and current strengths for use in warning systems for harbor-mouth navigation and densely populated coastal regions where beach safety is threatened. The offline applications are intended to equip coastal managers with the information needed to manage and allocate their resources effectively to protect sections of coast that may be most vulnerable to future severe storms. This report is presented in Portable Document Format (PDF); at least version 7 of Adobe Reader or similar software is required to view it. Download the latest version of Adobe Reader, free of charge. Barnard, P.L., O'Reilly, Bill, van Ormondt, Maarten, Elias, Edwin, Ruggiero, Peter, Erikson, L.H., Hapke, Cheryl, Collins, B.D., Guza, R.T., Adams, P.N., and Thomas, J.T., 2009, The framework of a coastal hazards model; a tool for predicting the impact of severe storms: U.S. Geological Survey Open-File Report 2009-1073, 21 p. [https://pubs.usgs.gov/of/2009/1073/].